Fast pace of work and life, unhealthy dietary habit and heavy psychological pressure, all these factors bring more and more people into hypertension problems. However, there are such a group of hypertension patients, whose blood pressure stay high even taking medicines under instruction of a physician. Why? In fact, persistent hypertension and adrenal cancer have close relationship, which patients should not neglect. Besides hypertension, what are the other symptoms of adrenal cancer? Adrenal cancer is malignant cancer that originates in the adrenal gland. It is divided into adrenocortical carcinoma and adrenal medulla tumors, etc. Cancer can happen in adrenal cortex and medulla. Cancers that can cause endocrine function variation are known as functional tumor, while those can not cause endocrine function changes are known as nonfunctional tumors. Most adrenocortical carcinomas are functional. They usually appear with virilization of female, hypercorticism, and are prone to local infiltration and metastasis. Generally, if metastasis through lymph nodes and blood vessels happens, the average survival time will be 2 years. Adrenocortical carcinomas usually have bigger sizes, which are often above 100 g. Some can reach more than 1000 g. They aggressively grow, have blur boundary, with brown yellow or multi-color section, soft nature, and often cause bleeding, necrosis, as well as cystis degeneration. 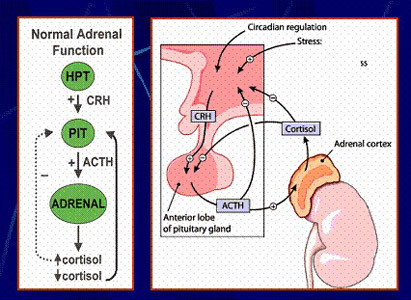 Adrenal cortex hyperplasia or tumor can also cause hypercortisolism, which can cause many symptoms, such as moon face, buffalo bump, central obesity, thin limbs, plethora and purple striae; tiredness, failure, low back pain, hypertension; hairy, hair loss, acne; sexual dysfunction, amenorrhoea or menstrual decrease. Cortical tumors can cause gonad anomaly syndrome, which is divided into enlargement and pubertas praecox of reproductive organs, pseudarrhenia and virilization of female. 80% - 90% pheochromocytomas originate in adrenal medulla, mainly with symptoms like hypertension, metabolic changes, paroxysmal hypertension, palpitations, shortness of breath, headache, sweating, mental stress, coolness of extremities and thrilling. Modern Cancer Hospital Guangzhou remind that, once above signs occur, one should go to regular hospital for examination timely and do not neglect even tiny symptoms that occur.